Sen. Marco Rubio, a Florida Republican. Florida Sen. Marco Rubio is clearly thinking about running for president. Yet the man who once led in early polling for the 2016 Republican nomination is stuck in the mid-single digits. In a field where no one is polling higher than the mid-teens, that isn’t devastating. Instead, what could hurt Rubio is the undermining of his chief argument for the nomination: He was the electable conservative, with a solidly right-wing voting record in Congress but still well-liked by the political middle. Just after the 2012 presidential election, when the GOP was looking for a new standard bearer, Rubio was viewed favorably by 30 percent of all adults. He was viewed unfavorably by 20 percent. That 3-2 favorable-to-unfavorable ratio is stronger than Hillary Clinton’s current ratings. But over the past year, Rubio’s favorable ratings have slid; his unfavorable ratings have risen. We can see this in Rubio’s net favorable ratings (the difference between his favorable rating and unfavorable rating). An average of polls taken since March 1 has Rubio’s net favorable rating at -4 points. The most recent Quinnpiac University poll shows 27 percent of registered voters giving Rubio a positive rating and 31 percent giving him a negative rating. An Associated Press-GfK survey found his favorable rating at 23 percent and his unfavorable rating at 27 percent. It’s not clear why Rubio has fallen. The decline in his popularity among adults corresponds almost perfectly with his push for immigration reform; his largest drop occurred in June as the Senate was debating comprehensive changes to U.S. policy. I wouldn’t argue that pushing for immigration reform made Rubio unpopular, but it did give him a lot of press. FiveThirtyEight has previously said that Rubio’s ideology ranks as quite conservative. It’s possible that Americans learned more about Rubio than just his views on immigration during that period. 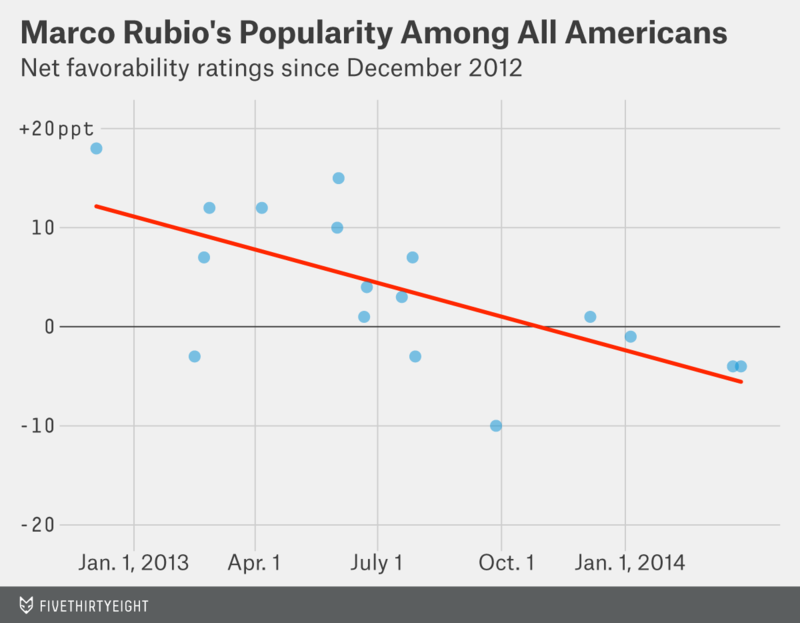 There is plenty of time for Rubio’s popularity among the general electorate to recover. The problem for Rubio is that his lack of a stronger electability argument may hurt him in the early, behind-the-scenes battle for campaign staff, donors, endorsements and other resources.